Delicious Cooking With Wine Recipes Squash Risotto! Continuing with the series, this time we have Cooking With Wine Recipes, Squash Risotto. I have developed this recipe for a number of reasons. The first is that squash is such a versatile vegetable; from the wonderfully varied winter squashes, such as acorn, butternut, pumpkin; to the many lovely summer squashes. The second reason is that I am sure to find squash in my CSA (community supported agriculture) box every week. I love Suzie's Farm CSA program, and every week it is an adventure; "What will I find in the box this week?" But it is also a creative challenge. I am making a valiant attempt at getting out of a cooking rut and exploring new dishes. I wanted to go beyond roasted squash, and since I love rice in every impersonation, I thought I would give risotto a try. The is a creamy, yummy dish. It can be a side dish, but adding shrimp or other seafood will turn it into a main dish. The wine and shrimp make it extra special and suitable for company, but it still feel very much like comfort food. This recipe calls for acorn squash, but you can use butternut squash, pumpkin, or any other squash that you love. Peel and cut squash into one inch squares. In a medium saucepan add about two tablespoons of olive oil. Add squash and cook stirring frequently. Season with salt and pepper. When squash begins to soften, add about one cup of chicken stock. Cover and simmer until squash is very soft. Mash with a fork or potato masher. In a large saucepan warm about three tablespoons of olive oil over medium heat. Add chopped onion and cook until almost translucent. Add rice and cook until slightly browned, about 5 minutes. Add the wine and stir until almost all liquid is absorbed. Add 1 cup of chicken stock, stirring regularly. When almost all liquid is absorbed, add another cup of stock. Continue in this manner, adding stock and stirring, until all the stock is used. Taste rice to see if it is done. If rice needs a bit more time, add another cup of stock and continue stirring. Add the pureed squash, Parmesan cheese, creme fraîche, salt, and pepper. Remove from heat. If you would like to turn the risotto into a main dish, add shrimp. In a large pan saute shrimp in olive oil until they turn pink. 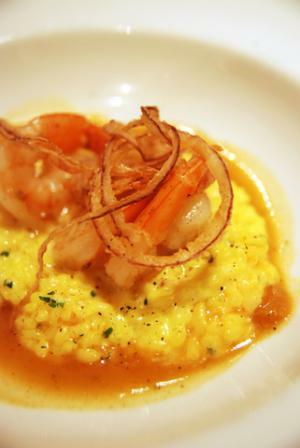 In a plate place the risotto and arrange the sauteed shrimp on top. Garnish with chopped sage and red onion to add some color. Enjoy Cooking With Wine Recipes Squash Risotto With Shrimp!